Nokia's major investors are gathering in Helsinki, Finland, for the mobile handset manufacturer's annual shareholder meeting, which is to take place today. This year's meeting comes shortly after the multinational corporation announced the $16.6 billion acquisition of Alcatel-Lucent, a move that marks a major vertical expansion in the wireless and telecoms carrier equipment and technology market space. A day before the event, GoodElectronics Network released an “alternative corporate history” of Nokia's rise and fall, the 2014 acquisition by Microsoft of its mobile phone business, and its latest bid to regain prominence in the mobile telecoms marketplace “from a workers' perspective.” Drafted by SOMO, the Netherlands-based Center for Research on Multinational Corporations, and labor research and rights organizations CEREAL-Mexico and Cividep-India, the study could serve as a proxy for the changes in global investment, employment and working conditions that have been taking place since globalization became a driving force in the 1990s. The fall of the Berlin Wall and China opening its doors to the world economy led multinational corporations and governments the world over to craft strategic plans that have shaped what is now a globalized economy. These events were compounded by rapid advances in information and communications technology and highly automated industrialization. The institution of an amalgam of government policies supportive of multinationals' strategic globalization plans facilitated an extraordinary surge in overseas expansion and an associated surge in global trade and commerce. These fundamental changes also led to an unprecedented transfer of technology, manufacturing capacity and jobs from industrialized nations to developing-market countries -- the BRIC nations of Brazil, Russia, India and China in particular. The results, according to researchers, have by and large benefited corporate executives and investors at the expense of workers in developed countries and workers' rights in rapidly industrializing nations. From the heights of market leadership, Nokia's fortunes fell dramatically in subsequent years, eventually leading management to sell its flagship mobile phone business to Microsoft in a $7.2 billion transaction consummated in April 2014. During its decline, it was Nokia's multinational workforce -- excluding those at C-suite level -- that bore the costs, GoodElectronics' report authors found. “When Nokia was eventually taken over by Microsoft in 2014, thousands of workers lost their jobs amongst others because production was shifted away from India to Vietnam. In the meantime, the proceeds from the Microsoft-Nokia deal were used to pay premiums to investors and bonuses to management” totaling some $5.44 billion. Added Cividep's Jasoon Chelat: "The Nokia plant in Sriperumbudur was projected as one of the most significant instances of big-league company investing in a Special Economic Zone in India. Although the first signs of trouble in Nokia's presence in Sriperumbudur is often cited as tax issues with the Government, a closer look into its operations brings to the fore a lack of regard for labor rights." With Nokia management looking to resurrect the company as a telecoms industry market leader, GoodElectronics says its time for management to repair the disconnect with its workforce, workers' rights and labor conditions, and time for investors to hold the company accountable. “With the recent takeover of Alcatel-Lucent, Nokia is becoming the largest supplier of network equipment (such as masts) that connect mobile phones, tablets and computers. We hope this next phase for Nokia will be one in which labour rights are truly respected,” GoodElectronics Network's Pauline Overeem said. The complete alternative corporate history of Nokia is available free for download on GoodElectronics' website. 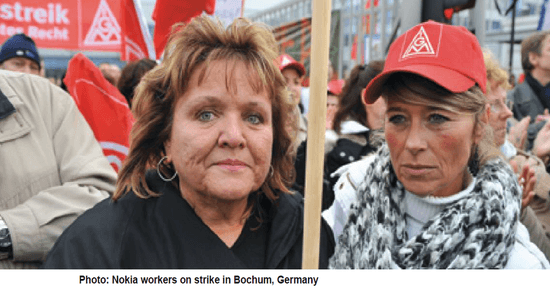 *Image credits: GoodElectronics Network, "Nokia Disconnected: A corporate history from a workers' perspective"